Explanation: Have you ever seen a little rainbow off to the side of the Sun? Rare but rewarding to see, such spectacles are known as sundogs, mock suns or parhelia. Sundogs are just sunlight refracting through hexagonal falling ice crystals in the Earth's atmosphere. When thin ice crystals flitter down nearly horizontally, they best refract sunlight sideways and create sundogs. Alternatively, randomly oriented ice crystals may create a complete circular sun halo. Sundogs occur 22 degrees to each side of a setting or rising Sun, although sometimes nearby clouds can block one or both. The above image was taken through a polarizing filter during October 2012 in Mérida, Spain. What bird is it? A goose, maybe? It is a spectrum, of course. The ice crystals act as prism. However, the explanation of th formation of a sun dog is incomplete. You get a bright spot (sun dog) when the 22 degree halo crosses and adds to the azimuthal arc which goes around the sky at the height of the sun above the horizon. The combination of the two gives the bright spot. The bird flying in today's APOD (May 27) is a white pelican. In identifying waterfowl, i hate to go against someone with the title "Wild Duck", but if that's a white Pelican, then it's lost it's beak. It does look like a wild goose, though. Beyond wrote: In identifying waterfowl, i hate to go against someone with the title "Wild Duck", but if that's a white Pelican, then it's lost it's beak. It does look like a wild goose, though. It's a bit hard to tell. If you assume the bird is flying to the left, it does look a lot like a goose. But if you see it flying from left to right, it appears to be pelican. I'm leaning towards the latter, myself. Flying left to right I don't have the means to reverse it's flight, so I'm stuck with the goose going to the left. I'd say a Heron flying to right. Geese don't fly alone, no Pelicans in Spain. I'm sticking with a pelican flying to the right. What you are seeing as the goose's neck I'm seeing as the pelican's tail. What you are seeing as the goose's tail, I'm seeing as the pelican's bill. Mérida is pretty far inland. It might be a pelican that is lost! Maybe an egret of some sort? I agree with you, stephen. Even though it's possible that it could be a pelican, the legs are so long. An egret fits the profile much better. It has the exact profile of Great Blue Heron which have been seen in Spain. geckzilla wrote: I agree with you, stephen. Even though it's possible that it could be a pelican, the legs are so long. An egret fits the profile much better. Beyond wrote: Flying left to right I don't have the means to reverse it's flight, so I'm stuck with the goose going to the left. After i read your post, i looked at the picture with a magnifying glass. Sho-nuff, it's one of them long legged wading birds flying to the right, with it's legs up behind it. Couldn't make out a tail, but there's gotta be one there somewhere. I said "tail", but was really talking about tail and legs together. Tail as in the tail end, which with many of these birds in flight is mainly the legs. 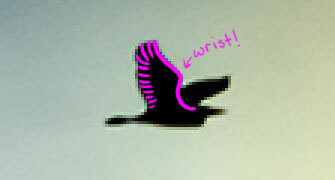 I have just one question: can a bird's wing tips ever point towards the front, as the near one seems to be doing? I'd say a Heron flying to right. Geese don't fly alone, no Pelicans in Spain. I've just come back to the board to discover that there has been such an informative discussion about the breed of bird! It didn't occur to me that it could be a heron(ish) bird flying to the right rather than an unusually lonesome goose flying to the left. Herons (including egrets, which are a related species) fly like that, I dimly remember. Storks and cranes fly with necks extended. As in the photo Art posted. Thanks Art. Such a flexible thing, a wing. That Art, he doesn't say much, but he sure articifies a lot of allusions. In the explanation it states the image was taken "during October 2012". For added interest I like to know the actual date that an APOD image was taken, so I got the image's Exif data from the properties of the APOD image and in that data it states "Create Date 2009:08:23" but also "Modify Date 2013:05:07". I am wondering therefore where the "during October 2012" comes from? I appreciate that date/time settings on camera may not be accurate but August 2009 and October 2012 is a lot of difference!